Guestroom includes one king bed or two double beds, a comfortable bathroom, and a private balcony or terrace. Room also features a minibar with a liquor dispenser, an in-room safe, and more. Located on the Yucatan peninsula, just a mile from Playa del Carmen, this resort is 31 miles from the Cancun International Airport. A pool on the beach, a pool with a poolside bar, and a pool for children. Surrounded by tropical gardens and a championship golf course, this property offers a relaxing atmosphere for friends, families, and couples. 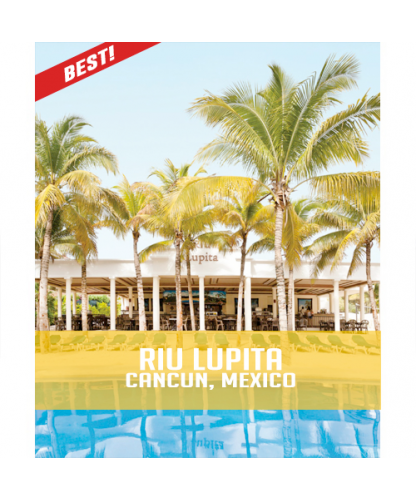 Just two miles away from a gorgeous beach (transportation provided), the Riu Lupita features three pools, a night club, a lavish spa, a club for kids, and 24-hour access to food and beverages. Check-in: 3:00 p.m.
Cozumel - Steak and grill restaurant located on the beach, next to Riu Palace Riviera Maya. Dante - Italian restaurant open for dinner only. Maria Bonita - Mexican specialty restaurant. Adelita - General restaurant with a terrace. Table tennis, volleyball, basketball, tennis, multi-purpose sports area, windsurfing, catamaran, kayaking, snorkeling, access to a spa and gym, and much more. Live nightly entertainment, shows at the stage, "Pacha" nightclub, and more. "RiuLand" offers supervised, daytime entertainment program for children.